USB C Power Charging port, PD Charging: Allow to Charge while use. 2*USB 3.0: Support 10Gb/s data speed transmission. No driver requirement, do not require any software, drivers or complicated installation process. All interfaces could work at a time! - 2017 MacBook/ MacBook Pro/ MacBook Air 13" & 15", iMac 21"
- Notice: All of Type c hub has fever problem, the normal temperature can allow up to 50 degree. It can't affect the usage function. 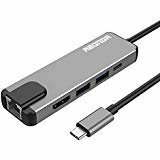 ★Multiport with High Speed Transfer: 2*USB 3.0 ports with data transfer rates up to 10Gbps allow you to upload and download photos, videos, music and other files quickly, and connect keyboard, mouse, thumb drive to your laptop. The Ethernet Adapter offers full 10/100/1000 Mbps gigabit Ethernet performance over the RJ45 Ethernet port. Faster and more reliable than most wireless connections. ★No Driver Installation: USB-C port multiport adapter offer a plug-and-play solution without more time for driver installation. If you have any questions about this product by Abonda, contact us by completing and submitting the form below. If you are looking for a specif part number, please include it with your message.